"This has been a Christmas morning tradition in my family for over 25 years. The ingredients are so simple; I think that is what makes it so delicious! It would not be Christmas without this casserole. Make this night before." Melt 5 tablespoons butter in a large skillet over medium-high heat. Saute bacon crumbles and onion in hot butter until onion is tender, 5 to 10 minutes. Add eggs; cook and stir until eggs are starting to set but are still moist, about 5 minutes. Melt 5 tablespoons butter in a saucepan over medium-high heat. Whisk flour into butter to form a thick paste. Add milk, Cheddar cheese, salt, and pepper. Cook and stir until cheese is melted and sauce is thick, 5 to 7 minutes. Stir seasoned stuffing mix and 1/4 cup melted butter together in a bowl. Stir eggs and cheese sauce together in a bowl; pour into prepared baking dish and spread stuffing mixture over the top. Cover the baking dish with plastic wrap and chill in the refrigerator, 8 hours to overnight. Preheat oven to 350 degrees F (175 degrees C). Remove plastic wrap from baking dish. Bake casserole in the preheated oven until heated through and set, about 30 minutes. You can substitute breakfast sausage or cubed ham for the bacon. You can substitute Lactaid® for the milk and omit the cheese to make is lactose-free. 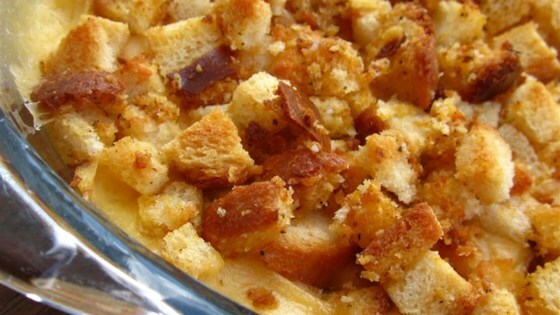 You can substitute cornbread stuffing mix for the seasoned stuffing mix. Substitute your favorite cheese for the Cheddar cheese. This is very good as written and a little different version than many of the other breakfast overnight casserole dishes because of the addition of the stuffing mix. A nice change.